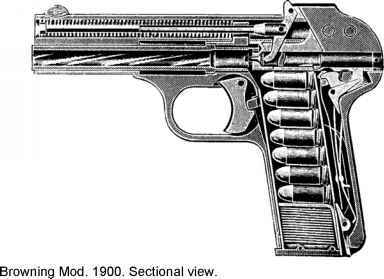 In 1955 John W. Kimball of Detroit, Michigan, designed and produced a few prototype models of an automatic pistol to take the powerful .30 cal. U.S. carbine cartridge. The gun was of the blowback type with a free-floating barrel which, it was claimed, made the gun more accurate and reduced the kick. The inventor stated that „the barrel recoils straight back 3/16 inch eliminating a great deal of the recoil, thereby keeping the gun on target for faster shooting in an emergency." A unique feature was the shallow grooving or scoring which was put into the chamber for the purpose of holding the case back at the moment of firing. To prevent the cartridge from being retarded in the act of chambering, the scoring was polished away at the top of the chamber where the nose end of the bullet came in contact with this surface. The scoring, if present at this point, would also be likely to scratch or damage the bullet. How effective this scoring of the chamber was in accomplishing its stated purpose is not known. As the case of this powerful cartridge undoubtedly expanded and pressed tightly against the chamber walls at the moment of firing, the increased friction caused by the scoring should have had some retarding action. Another feature stressed by the inventor was the smoothness of the trigger pull, which he claimed was attained by a „camming" action. Those who have used the pistol agree on this point and state that the pistol performs remarkably well considering the power of the cartridge. In 1956 the firm J. Kimball Arms Co., then located in Wayne, Michigan, was formed for the production of the pistol. Factory literature stated that while current demand was for the .30 caliber model it was the intention to produce it in .22 Hornet, .357 Magnum, and .38 Special calibers, as well. Specifications for the standard .30 caliber model are given in Table 33. Two other models, of the same general construction, were available. The Combat model differed principally in that it had fixed sights and weighed 34 ounces. The Air Crew model was again of the same basic design as the regular model, but had fixed sights, a 31/2-inch barrel, a total length of 8 inches, and weighed 29 ounces. This firm is no longer in operation.